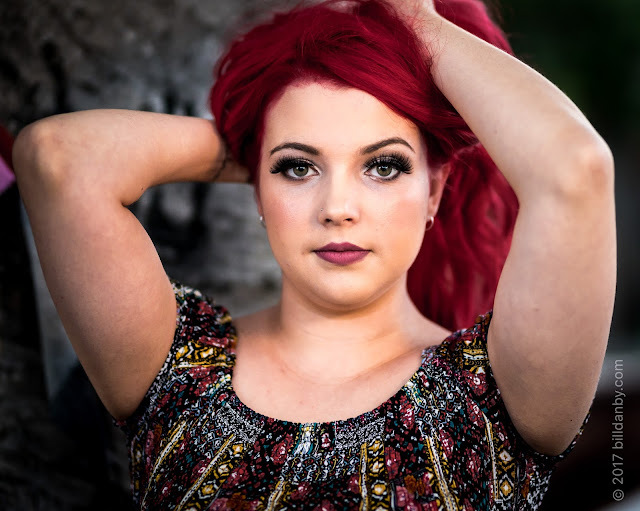 The model above is the wonderful Keeley, and her red hair is much brighter than is shown here. Most colour monitors and most colour printers can't reproduce the actual colour of her red hair. It's said, then, that the colour of her red hair falls outside of the gamut of the monitor or printer. squeezing the colours of the image into the smaller colour space of a target printing paper and ink set. Keeley's hair proved an intractable problem. It was partly a question of moving between the colour spaces, as the Lightroom colour space (ProPhoto RGB) addresses more reds than my monitors or printers. But also, my widest gamut printing paper, Canson Baryta Photographique, provided no appreciable benefit over my usual Canson Platine Fibre Rag. That original red was was well outside either papers' ability to resolve it. And, printer rendering intents (perceptual or relative — a discussion for another day) showed no difference between final prints. In the end, my only "solution" for getting to acceptable sRGB images and colour prints, was to significantly reduce the saturation of the red, and decrease the luminance to keep the hair an acceptably dark colour. This meant that Keeley is shown with attractive, dark, red hair, but without the brightness of the her real hair. It's not a perfect world.